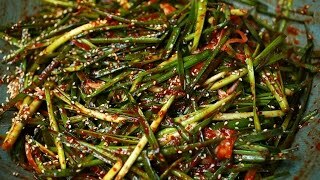 Hello everybody, today I’m going to show you how to make kimchi with Asian chives (a.k.a garlic chives), which are buchu in Korean. It’s called buchu-kimchi, and it’s simple and fast to make but very delicious. It’s refreshing with a green onion-y, chive-y taste that’s lively and spicy. I like to eat this kimchi best when it’s fresh, almost like a kimchi salad. It doesn’t have to be fermented for you to enjoy it, but you can ferment it if you want. Once I taste this kimchi, I automatically think about rice. 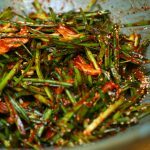 It goes well with rice and when combined with a stew (like doenjang-jjigae) and a fish side dish (like seasoned pan fried flatfish) it’s a perfect meal. I made this kimchi for my readers who came to my meetup in Paris. It was a potluck party, and everyone brought their best dishes, as well as Korean food and even real French cheeses and wine. Everything was gorgeous and delicious, you can’t find that kind of food anywhere else in the world! You see some of the dishes in this video but there were many more, they kept coming as the night went on! When I went to Paris I didn’t know what I was going to make for the party, but I checked the Korean grocery store listings for France on my website and found K Mart (thanks newhatchepsout for posting it! ), and there I found good quality napa cabbage and Asian chives. I got the idea to make two kinds of kimchi: buchu-kimchi (the recipe on this page) and traditional mak-kimchi (which I posted a long time ago) with French oysters. I don’t know why they have such nice buchu in Paris but the buchu there had long stems, good color, and was so fresh and tender that I immediately decided to make buchu-kimchi with it as soon as I saw it. What a wonderful party we had! I thank everyone for coming and especially thank Maria Saad and her husband for offering to host the party for us. They put a tremendous effort to make the night successful. I tried to taste all kinds of foods when I was in Paris. Check out my blog post to see what kinds of places I went to and the things I tried. I hope you enjoyed this video. I have more videos from France coming up so stay tuned! 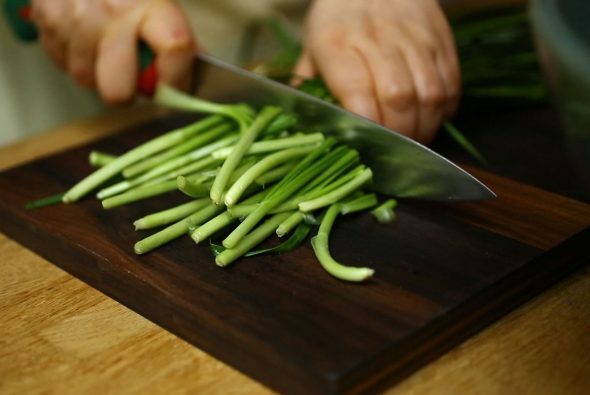 Cut the buchu into 2½ inch long pieces and put them in a large bowl. Add the fish sauce and mix by hand to evenly spread the fish sauce in the pieces. Let it sit for 30 minutes, turning it over every 5 minutes. 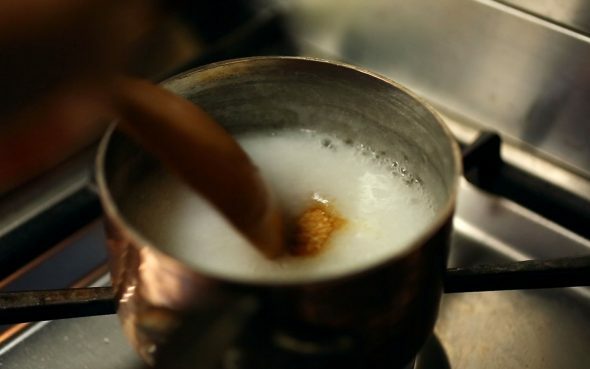 Mix sweet rice flour with 1 cup of water in a small pan. Cook over medium heat, stirring with a wooden spoon. A few minutes later when it starts bubbling, add sugar and stir for another minute. Remove from the heat and let it cool thoroughly. Move the salty buchu into a strainer over a bowl so it captures any salty water drippings. There will be some salty liquid left over in the bowl. Add the cooled porridge and hot pepper flakes. Mix it well with a wooden spoon. Add onion, buchu, and the strained salty water drippings. Mix it all together gently. Sprinkle the sesame seeds. You can serve it right away with rice, or put it in an airtight container to eat later. If you want to ferment the kimchi, keep it at room temperature for a couple of days until it tastes a little sour, then put it in the fridge. Posted on Thursday, December 15th, 2016 at 2:11 pm. Last updated on January 14, 2017. Posted November 5th, 2018 at 9:09 pm | Log in to reply. I am making this tomorrow! One thing: I miss you 80’s background music from the New Wave!!! Posted September 30th, 2018 at 12:28 pm | Log in to reply. I didnt use the rice porridge this time because the chives give off a little little bit of “slime” when sitting in the fish sauce that grab the spices really well! This has such a nice flavor! my partner said it reminds her of her favorite vietnamese digging sauce. Posted October 3rd, 2018 at 8:49 am | Log in to reply. Mmm! All the dishes look delicious! All we need is a bowl of rice. Posted January 25th, 2018 at 4:43 pm | Log in to reply. Hi Maanchi! I would like to let you know that your blogs and videos are truly marvelous and a life saver! I just moved here in korea and my husband (korean) simply adores my cooking thanks to your recipes!!! I came from the Philippines so i usually make 2 dishes every meal one korean and one Philippine dish.. thank you so much for sharing your talent with everyone! Posted January 27th, 2018 at 9:15 pm | Log in to reply. I’m sure you are so good at cooking! Not only Korean food but Philippine cooking too! Now that you’re in Korea you can learn about all kinds of Korean cooking, because all the ingredients are there! Posted November 12th, 2017 at 5:23 pm | Log in to reply. Posted May 17th, 2017 at 2:44 pm | Log in to reply. Posted December 23rd, 2016 at 6:29 am | Log in to reply. Posted December 22nd, 2016 at 12:03 am | Log in to reply. Posted December 16th, 2016 at 12:51 pm | Log in to reply. I have a question that has been bugging me for a while – is gochu-garu different than the normal red chilli flakes available elsewhere? If it is different, then how? And if I use the normal red chilli flakes in a dish calling for gochu-garu, how will the taste differ? Posted December 16th, 2016 at 2:34 pm | Log in to reply. Gochu-garu varies from hot to mild and contains nothing but chilli, sometimes with, sometimes without the seeds. Posted December 16th, 2016 at 4:12 am | Log in to reply. Posted December 16th, 2016 at 10:27 pm | Log in to reply. KM: Maangchi uses a 1/2 cup measure (red) for the fish sauce and a one-cup measure for the water used with the flour. Enjoy! 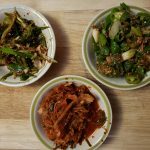 This recipe was originally posted on December 15, 2016 at 2:11 pm by Maangchi. It was last updated on January 14, 2017. The video was watched 961,099 times on YouTube & has 13,756 likes!